Well, this is a exciting new entry to the vampire genre. A dark, gothic-y tale with some intricate world building, plus a tormented hero and a dangerous heroine. Right up my alley. I'm not sure if I would categorize this book as urban fantasy or paranormal but since the publisher is Orbit, it's probably considered UF. Whatever it is, I liked it. Despite some familiar tropes, Painter's take on the world of vampires manages to be fresh, layered with a deep, rich history and the result is a multifaceted world ruled by complex power structures. Back Cover Blurb: The lacy gold mapped her entire body. A finely-wrought filigree of stars, vines, flowers, butterflies, ancient symbols and words ran from her feet, up her legs, over her narrow waist, spanned her chest and finished down her arms to the tips of her fingers. The thing that really stood out for me in this book was the world building. I found the complex, ritualistic world of the Comarré fascinating. The Comarré are much more than beautiful bags of blood. Their long history of service is coupled with numerous secret traditions and that makes them a force to be reckoned with. There is also a large cast of magical secondary characters and it is a testament to Painter's skill that they are all sharply drawn, three dimensional individuals, each with their own culture and customs. They may be familiar character types - vampires, ghosts, shapeshifters, hellhounds, etc. - but here they appear original, not the same old, same old. The main couple was fine. I wasn't too keen on Chrysabelle. She was just a little too perfect - strikingly beautiful, cunning yet naive, and sweet yet lethal. Y'know, super special kickass awesome and I'm leery of that. It's boring. But it didn't get in the way of my enjoyment of the story. The hero was kind of dreamy - if you like tormented, grim, menacing types... which I do. Malkolm is a vampire straddling a murderous edge. He has been cursed after having broken the one sin among vampires: Thou shall not kill thy brethren. Now any life that he takes will manifest in spirit form and haunt him. Those he killed before he was cursed exist as voices that constantly clamor inside his head. And the names of all are etched into his skin. He is an outcast and anathema among his own kind, tortured by his past misdeeds. His emotional agony is, perhaps, a bit over the top but the angsty melodrama, coupled with Chrysabelle's perfection, balanced out and worked for me. However, there were a few things that didn't work as well. I never understood how Mal gained the rights to Chrysabelle's blood. It seemed to happen almost accidentally and... too easily. 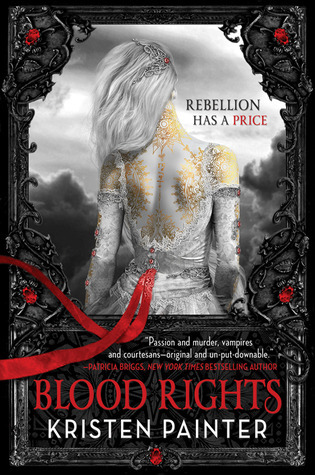 Considering the intricate rules and etiquette that bind the two groups, I would think blood rights would be gained more formally in some sort of ceremonial or official manner. Also, and I’ll try to be vague because I don’t want to spoil the ending, there are several reveals at the climax that come across as soap opera-y and to my mind, were unnecessary as they added little to the story. The surprises felt flat and one-note, a stark contrast to the proceeding complexity. I've read these kind of plot devices before and in this particular story, they came across as manipulative and cliched. So what is primarily a unique entry into the vampire oevre ended on a slightly disappointing note. But this is a small bump when compared to the rest of the book and I am looking forward to the next entry in the series. Painter has many rich opportunities to build upon her already intriguing world. Just a side note: The cover really reflects the tone of the story and is gorgeous. I say this as someone who is not a cover-lover, more of a cover-hater -couldn't care lesser. A cover like that almost deserves to be on hard cover. The artist is Nekro and he also did the cover for Brenna Yovanoff's The Replacement, another book with a fantastic cover. He has illustrated the covers of quite a few books which you can check out here.